Procter & Gamble (NYSE: PG) has been in the news a lot recently due to the ongoing struggles taking place at the board level. Basically activist investor Nelson Peltz of Trian Fund Management wants a seat on the board so he can push for changes in how the firm is run. Without going into too much detail the whole episode has descended into a rather unedifying spectacle as both sides contest the outcome of the recent shareholder vote. Though I’m skeptical of the short-termism that often accompanies activist investors such as Peltz he does have a point in some of what he says. That said it’s also important to dismiss some of the hyperbole surrounding the company. In various articles I’ve seen its plight compared to that of other current and former blue chip giants such as General Motors, General Electric, Kodak and IBM. Now, as far as I can see, the only real connection between any of those companies and Procter & Gamble is that they are American and have also gone through rough spells down the years. The comparisons with Kodak and General Motors seem particularly over blown to me. In the case of Kodak its profit center literally became obsolete because of new technology. As for General Motors, well, it operates in a cyclical industry which is notorious for being both capital intensive and not earning its cost of capital. Procter & Gamble, on the other hand, is almost the complete opposite. Are brands like Tide, Head & Shoulders and Gillette at risk of becoming obsolete any time soon? Not likely. Furthermore, the company’s earnings power is still incredibly strong, churning out gobs of cash year in, year out. Personally I can live with a rough patch when the underlying business is still throwing off a 15% free cash flow margin and 15% returns on capital. The issues here seem to revolve around growth, market share and corporate culture. 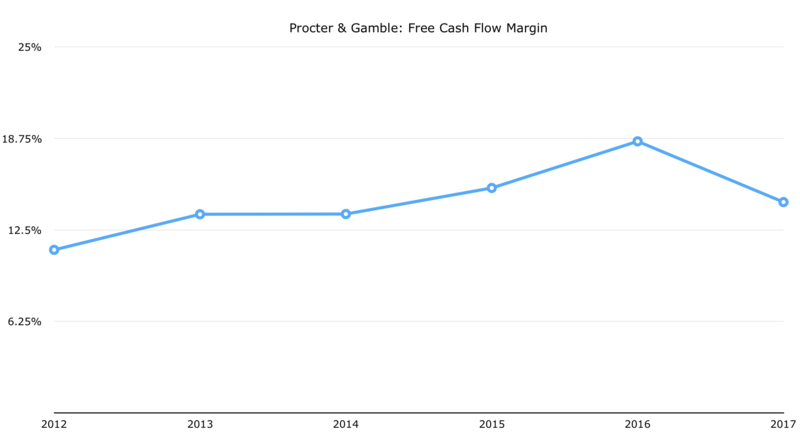 A decade ago Procter & Gamble was bringing in around $3.05 per share in net profit. In the company’s 2017 fiscal year that figure came in at around $3.70. Now I wouldn’t necessarily bat away earnings growth that can only match inflation – even if it is over a decade or more. I mean imagine if you had to rely on P&G income to fund your lifestyle. Let’s also assume that income growth will track earnings growth, which is kind of a given in the long-run. Would it be the worst thing in the world if all that investment did was maintain your standard living? Probably not. The problem is that over the same period of time the company has reduced its share count by around a fifth. In other words there’s basically zero organic growth going on here. So how does the company get back to growing? It’s a tough one given the company’s size and the fact that many of its products are less sticky in terms of pricing power than other defensives (e.g. tobacco). One of the recurring themes of the past few years has been P&G’s inability to match volume growth with pricing gains. When you walk into your local grocery store it’s not hard to see why: the brands are very expensive relative to generics. Now with a lot of consumer products that fact makes no difference whatsoever. Coca-Cola is a good example, as are cigarettes. Unfortunately for P&G a bunch of its products (e.g. washing up liquid) tend to suffer more against generic competition. The company must hire senior line management from the outside. If your beauty line has been suffering for a decade, why wouldn’t you want to get someone from L’Oréal or Unilever? It’s kind of hard to argue with that. I mean L’Oréal has increased earnings per share by 113% over the past ten years. Unilever has done so by around 50%. The latter has also taken a fairly big bite out of P&G’s Grooming segment (of which the crown jewel is the Gillette shaving brand). The biggest headwind as I see it though is the current valuation. As it stands Procter & Gamble shares are trading at 21x estimated 2018 earnings. 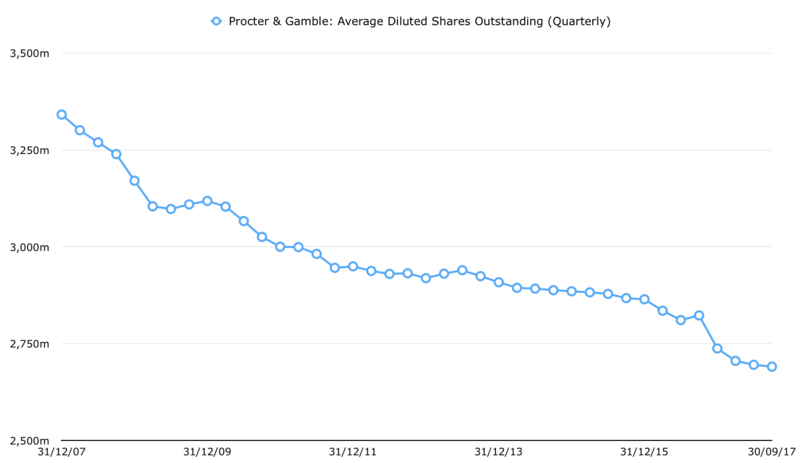 Now for anyone who’s built a large position in P&G stock over the years I don’t think that really matters. You get to just sit back and collect what is probably a fairly meaty dividend yield on cost. Given the company has paid a dividend in every year since 1890 I don’t think long-term holders will be sweating it too much. The situation is different for anyone on the outside. Unless you’re outlook is an exceptionally long-term one then it’s going to be hard to make the numbers work when you’re looking at best case growth scenarios of inflation plus one or two percent.